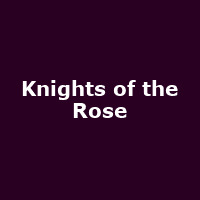 "Knights of the Rose is a classic rock musical of Shakespearean proportions. Featuring the ultimate playlist including legendary ballads and timeless anthems from Bon Jovi, Meatloaf, Bonnie Tyler, No Doubt and many more. In this epic tale of love, betrayal and sacrifice, the noble Knights of the Rose must defend their House and their honour. Even as the chivalrous Knights return from a glorious victory, a greater threat against the kingdom stirs. As they face the greatest battle of the Age, and betrayal threatens to tear them apart, can true love and honour triumph?"